What would you scan? This is the question posed on the front page of matterport.com, Matterport 3D’s official website. The site also features scans done by the Matterport. The photorealistic scans of actual interiors resemble dollhouses. Matterport 3D is both software package and scanning hardware. In the past year there has been an emergence of 3D scanning technologies that promise to revolutionize the way we interact with the physical and digital world. 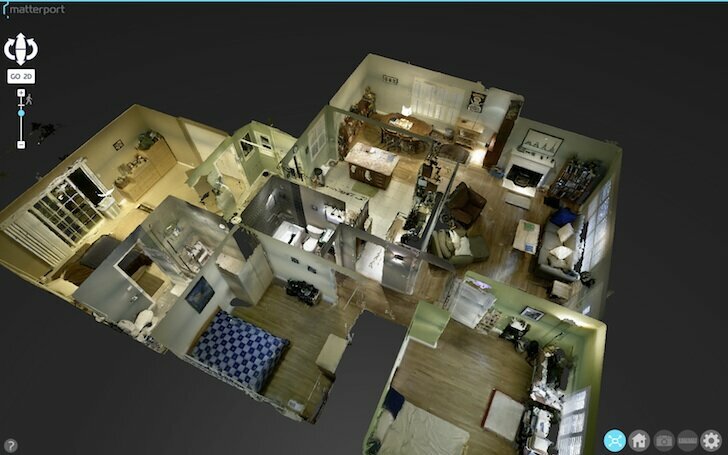 While software like 123D, ReconstructMe, and SurfaceRecon turn photographs into 3D images of individual objects, Matterport 3D can scan an entire room. It’s kind of like having a camera that captures 3D images. Originally the device was handheld. However, engineers scrapped the handheld model in favor of a device that sits on a tripod in the center of the room. Still, Matterport 3D hopes that the hardware will eventually be handheld again, perhaps even integrated as an app on an individual’s phone or tablet. It will be available for sale early next year, with a limited presale happening at the end of this year. So what would you scan? Florence says one of the coolest suggestions made to their website came from a couple who lived on boat. They were expecting a baby. The owner of the boat was selling it, and they were forced to move. They wished that they could scan the place where they had spent many happy years as a couple. That way their memories of the boat would be available to their child as she grew older. Other uses of the Matterport include retailers collecting data about customer’s interactions with store layouts, architecture firms, and a veterinarian who wants to scan livestock for research. It was even hinted that Apple Maps could use the Matterport in the future to map interiors. And what about 3D printing? That won’t be possible until interior scans are “watertight.” Currently, models frequently have holes in areas that the scanner can’t see, such as under tables or in shadows. Engineers are working on solving this problem. There’s no question that the ability to scan and print 3D models will have a strong impact on the fields of architecture and interior design.